I Hate Music seems like a really dumb title for an album. 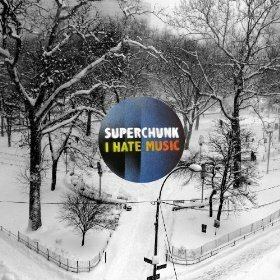 Like some jerk musician is saying, “Look how cool and detached I am.” But this is Superchunk, a true fan’s band for over 20 years. Half of the band members own a record label. If anyone is allowed to claim to hate music it’s them. Also, consider the context. The album’s title comes from the lyrics of “Me & You & Jackie Mittoo.” The narrator of the song hates music because it doesn’t have the power to bring people back, but concedes that the memories a song conjures can be the closest thing in their absence. What it becomes is a celebration of music. It’s also a great pop song. This melancholy yet upbeat feel persists throughout the record. “Overflows” kicks things off with a soft acoustic guitar and plaintive lyrics before the band kicks in and rocks. It feels like what “Me & You & Jackie Mittoo” was describing. Maybe you’re feeling down and kind of introspective, but when the band kicks in it’ll all be alright, at least while the song lasts. Similarly, “Your Theme” asks one to sum themselves up with a song. With the line “Learning how to be and not to seem” Mac McCaughan is saying that the right piece of music can show the world who you are. Then in “FOH” he sings, “How’s everything at the front of the house?/The drums exploded and our amps are down/But Matthew’s got it wired and we’re coming around.” Here it’s the music itself that is trying to overcome adversity and the listener knows who will triumph in the end. We know through the use of a chant-along chorus, a tool which always makes the artist and audience feel like one. A song like this should be a huge hit. People everywhere should be chanting along with the chorus. “Me & You & Jackie Mittoo” should be on the radio so people can hear it while they’re driving in their cars and thinking about the friends that are no longer part of their lives. This will never happen though because we live in a time where catchy yet meaningful songs don’t get airplay and Superchunk will have to remain a cool indie band, spoken like a password between people in-the-know. That’s why I hate music.